Good morning everyone! Today I thought I would share a fun cooking activity that your kids are going to love. Thanksgiving is a time of year when families come together, which more than likely means you will have a lot of children running around the house. Keeping the kids busy while the adults prepare the Thanksgiving feast can sometimes be a big challenge. 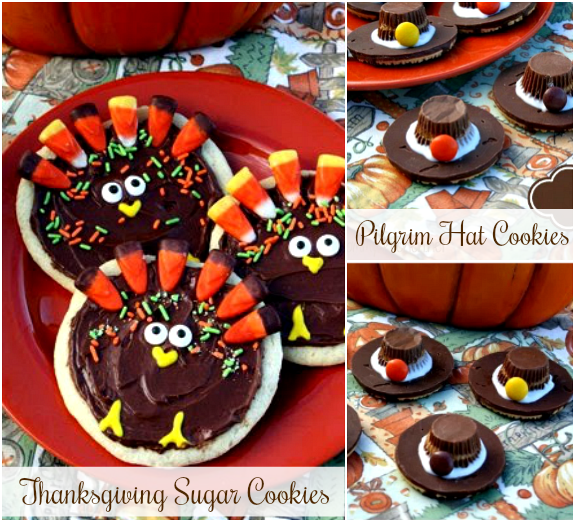 As a Walmart mom I was asked to share a fun Thanksgiving Craft with all my readers. 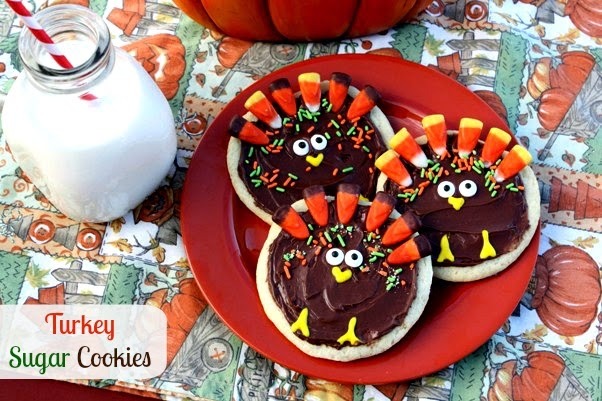 These cute Turkey Sugar Cookies are the perfect activity to entertain the kids while everyone else is busy in the kitchen. These festive turkey cookies start with store bought sugar cookie dough and are finished off with, chocolate frosting, candy corn, edible candy eyes, colored icing and sprinkles. This is the perfect recipe if you have leftover candy corn from Halloween. If you don't have any candy corn Walmart has all their Halloween and fall candy on clearance, so you can pick up a few bags pretty cheap. All the Halloween clearance was located in the front of the store in clearance shopping carts. 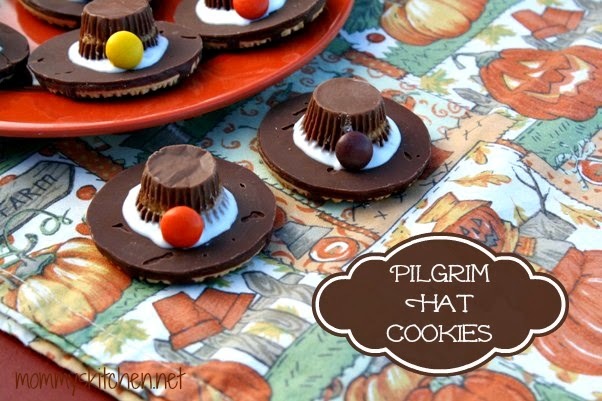 We also made these fun little Pilgrim Hat Cookies. Personally I have found the more activities you have available, the less likely the kids will be underfoot and in the kitchen. You can also enlist the help of the older kids to monitor the whole activity, because both of these cookies are a fun for everyone! Pillsbury or great value sugar cookie dough, chocolate frosting, candy or Indian corn, edible candy eyeballs, fall sprinkles, writing icing, stripped shortbread cookies, white cookie icing, mini peanut butter cups or rolo candies, fall M&M's or Reese's pieces. Just supply the baked cookies and the all the edible decorations, and let the kids decorate the cookies. 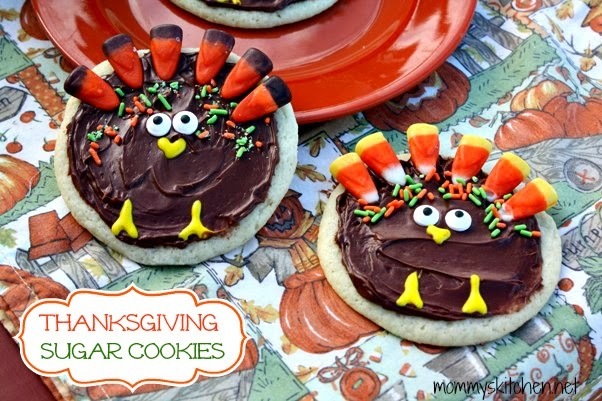 I found that baking the sugar cookies ahead of time for the turkey cookies is a great time saver. I just store them in a large Zip lock bag in the freezer. Mackenzie is making the turkey cookies and Carson is working on the pilgrim hat's. Preheat oven to 350 degrees. 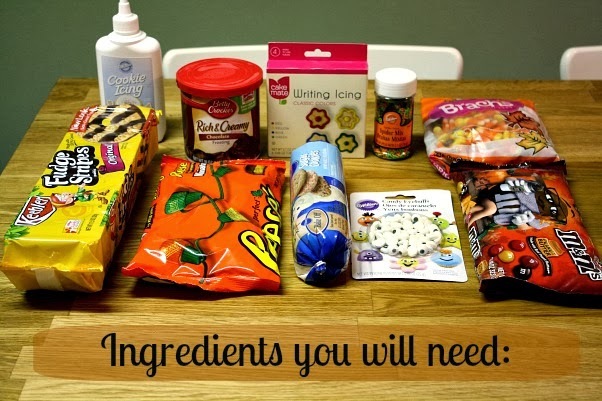 Remove the cookie dough from the wrapper and place into a large bowl. Add flour and knead into the dough. Roll the cookie dough out on a lightly floured the surface as well as a lightly floured rolling pin to 1/4 inch thick. Cut the cookies using a round (2 1/2 inch) cookie cutter or use a drinking glass. Place cookies 2 inches apart on a on a lightly greased baking sheet. Bake 11 to 14 minutes or until edges are light golden brown. Let cookies sit on baking sheet 10 minutes before removing. Remove cookies to a cooling rack to completely cool. 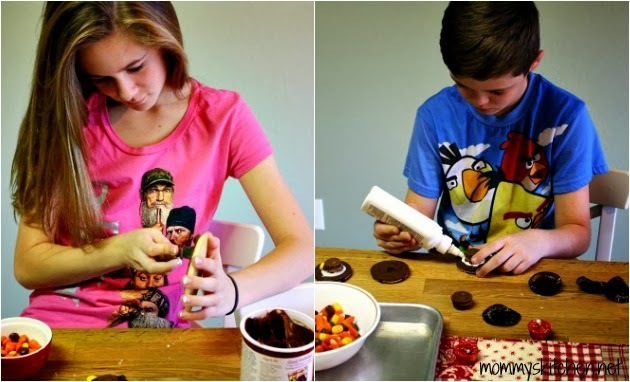 Using a offset spatula or butter knife frost and decorate 1 cookie at a time with chocolate frosting. After spreading the chocolate frosting on cookie, add the candy corn for feathers. Pipe yellow icing for beak and feet. Add edible candy eyeballs and festive fall sprinkles. Repeat with remaining cookies. Cook's Note: homemade sugar dough can be substituted for store bought in this recipe. Holding the bottom of a peanut butter cup, squirt about 1/2 teaspoon cookie icing on the top. Position the peanut butter cup over the center hole on the bottom of cookie and press down. Squirt additional cookies icing around the peanut butter cup to form the hatband. I found it easier and neater to hold the bottle of icing pretty high up as you squeeze out the bottle. It makes for a thinner line to make the hatband. Holding it too close will make the icing run making a flatter hat band. Add one m&m or Reese's peanut butter piece for the buckle. Repeat with remaining cookies and peanut butter cups. Let cookie dry before eating. While I was at Walmart I picked up a Thanksgiving Themed Paper Table Cloth. The tablecloth has fun activities printed right on it! I found the table cloth in the party section near the Holiday themed plates & napkins for $1.97. The crayons were .25 each. The holiday tablecloth has Tic-Tac-Toe, Thanksgiving crosswords and lots of coloring pictures. Hopefully I have given you a few ideas to help keep the kiddos busy this Thanksgiving. Great idea for the Grandchildren! We have made the pilgrim hats but not the sugar cookies! thank you for so many recipes and helpful hints (never would've thought to buy the thanksgiving paper tablecloth) and am planning to make the 2 types of cookies for our Child Evangelism Fellowship Release Time...have a beautiful, thankful Thanksgiving. Our Girl Scouts Juniors troop made the turkey cookies this week for one part of earning their cooking badge. They really enjoyed this activity! I think I may get the ingredients for my daughter to make the hat cookies for Thanksgiving. Thanks for the great ideas!